This is one of my favorite days of the year. While most of us are still packing away Halloween decor and easing into Fall, the Michaels Makers have been decking the halls. This is all in an effort to create a little bit of inspiration for when you decide to break out the decor. This year is a special one for us as my sister and her family are back from their move to Singapore and will be spending the holidays with us. Family is everything and my sister is overjoyed to be hosting Christmas in her beautiful home. So when I thought about this year’s dream tree, two things came to mind. Cable knit . . . a symbol for the coziness that this season evokes. Warm, snuggly nights and pretty textures. Cocktails. . . representing the good cheer and welcoming spirit that Christmas stirs up. I love nothing more than that warm cozy feeling mixed with opening our homes to friends and family. Keeping it classic and simple, here is “Cable Knit & Coctails” in my sister’s lovely home. I placed the dream tree in my sister’s foyer. I thought it would be so pretty to greet guests when they arrive with a cocktail. Have you done that before? Sounds fancy but is actually very simple to do. Stay tuned below for the recipe for this delicious drink. 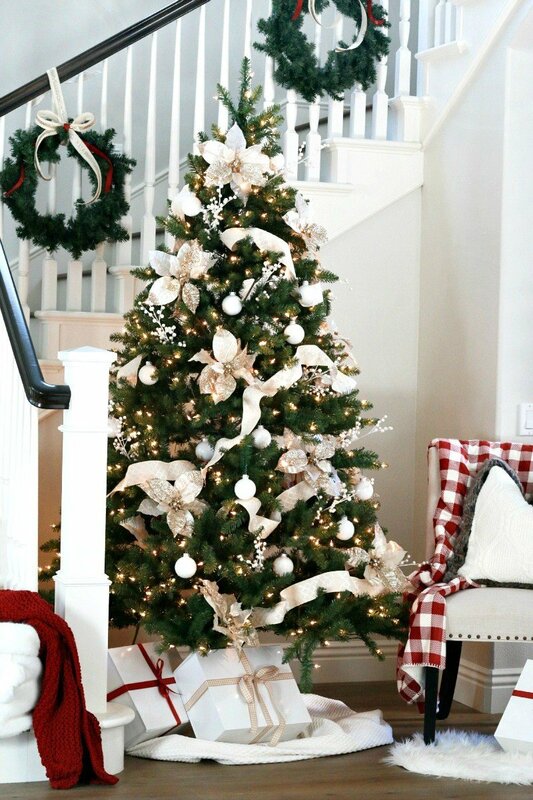 I wanted to keep this tree monochromatic with different shades of cream and white. I used four simple things: large, glittery pointsettias, pearl berries, white ornaments, and a textured ribbon. You don’t have to go crazy when creating a classic look. Just remember to mix your textures and colors so the overall look is layered and interesting. The cranberry color creates a nice pop and is easy to carry out with packages wrapped up with satin bows and a cable knit throw. 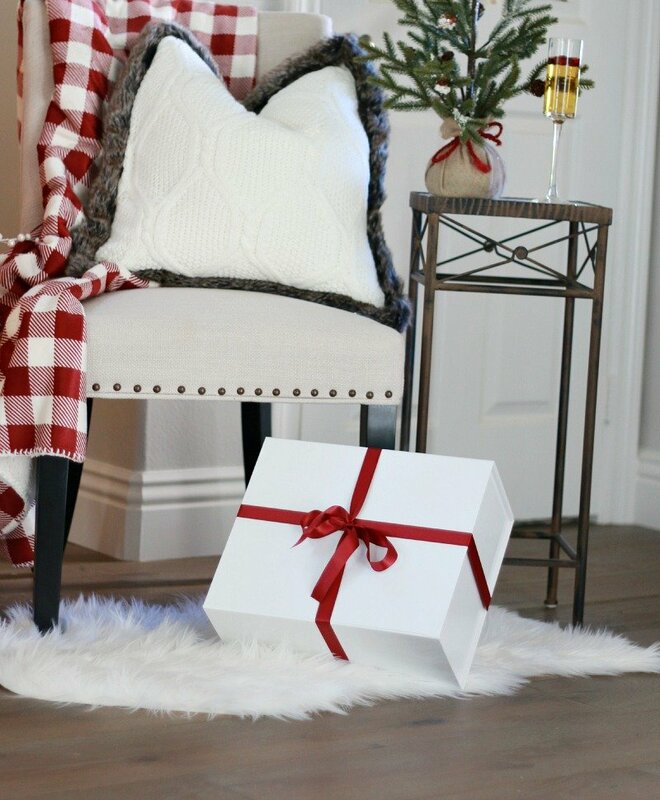 This white, furry bucket is from Michaels and I just adore it. During the holiday, I often shop my home and move things around. 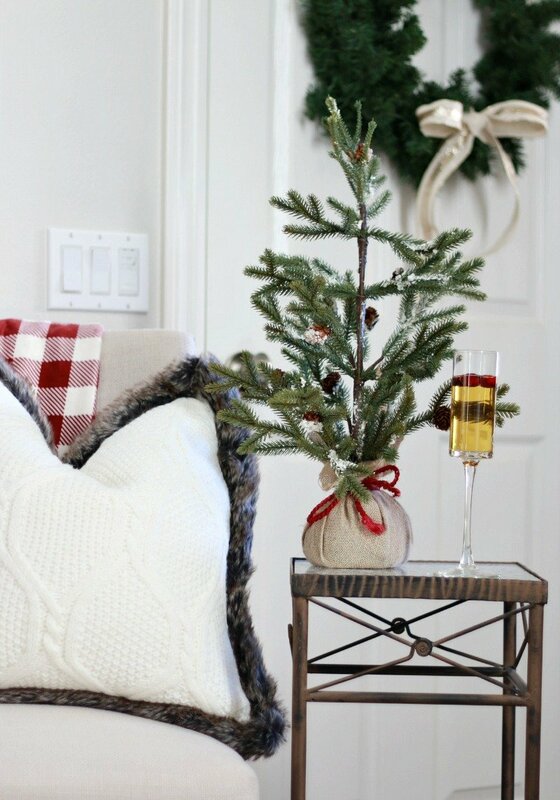 Placing a chair or bench next to your tree extends your decorating space and looks so inviting. Because I was keeping this tree relatively simple and clean, I was important to mix finishes and textures. 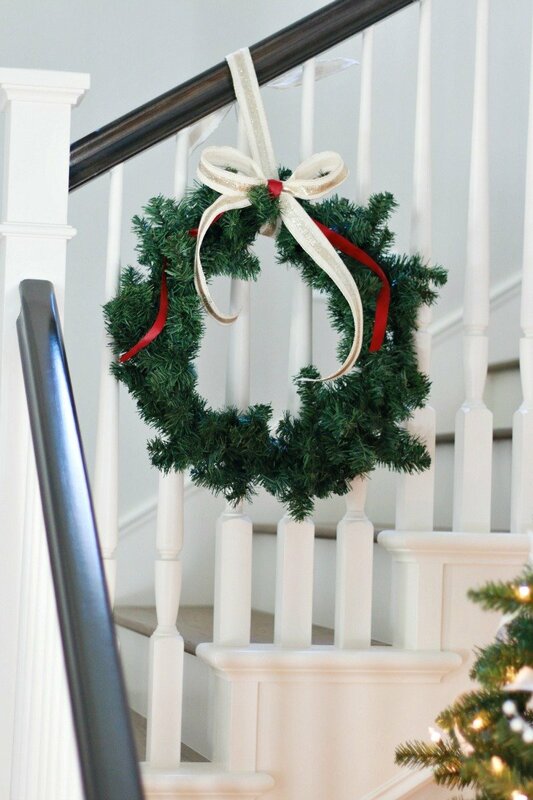 I have always been a wreath girl. I just love the classic and traditional look. I hung these with gold ribbon from the banister. It’s a nice change from garlands and keeps things clean and fresh looking. To tie in the cranberry color I added more of the satin ribbon to each wreath. There is no denying how cozy and warm cable knit is. And the bonus is that you can actually curl up with your decor! I loved the texture on this ribbon. If you are looking for it at Michaels, it is not in the Christmas section so it is actually available year round. It adds more of the cozy, cable knit feel. That’s my beautiful sister. I wouldn’t mind walking down these stairs to entertain! I am so excited to celebrate Christmas here with my sister and her family. With my parents nearby and family back, it’s going to be a really special time of year. 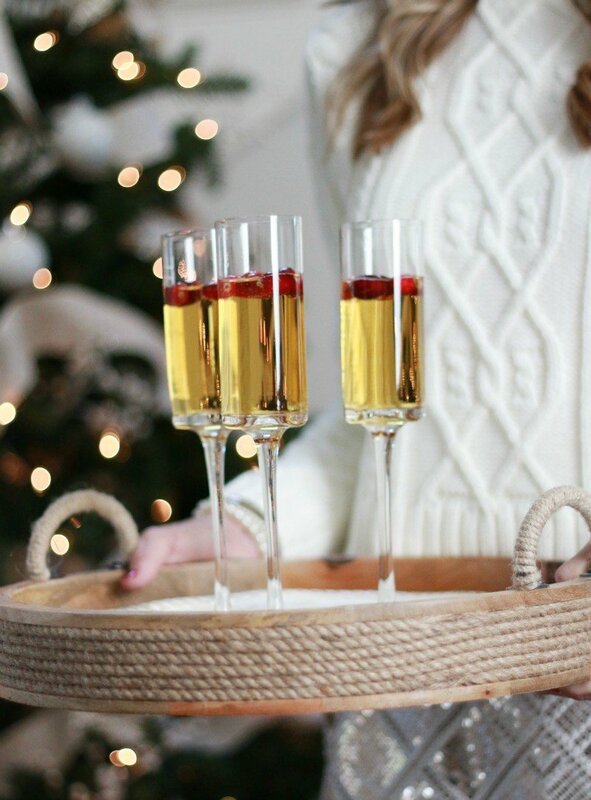 This yummy drink is actually a Salted Caramel Apple Cider Cocktail. Yep. You heard that right! And of course you can make it non-alcohlic as well. Here is the very simple recipe. 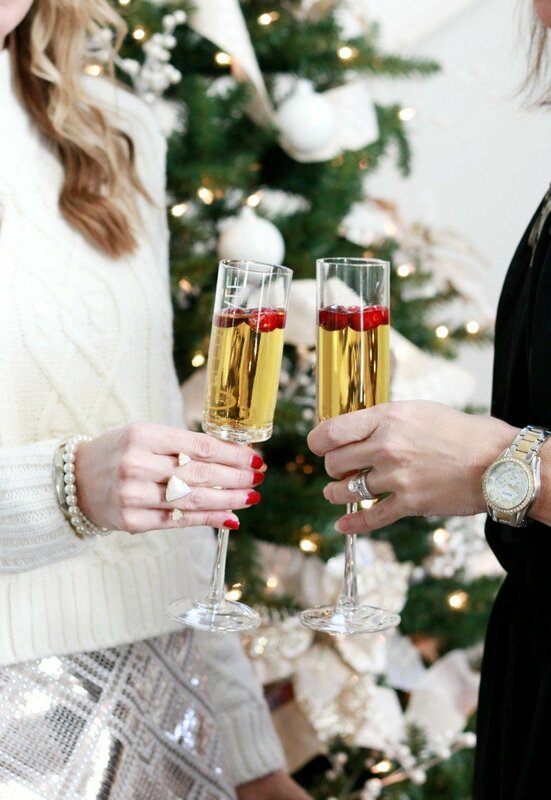 Cheers to kicking off a warm and cozy Christmas! 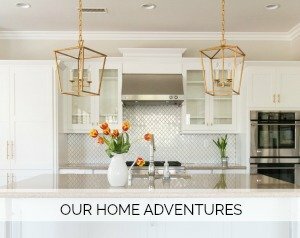 I hope you have found some inspiration for your own home. I am all about keeping it simple and chic and spending the majority of our time being with family and friends. 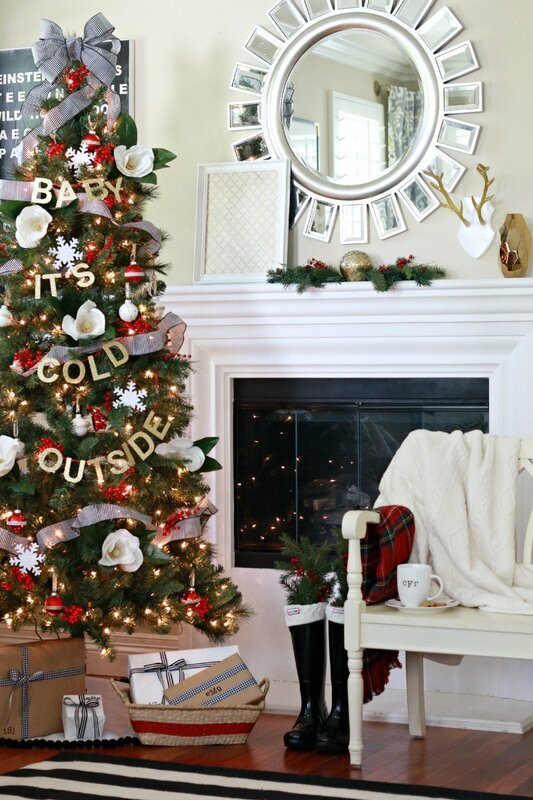 Last year I created a “Baby It’s Cold Outside” tree which you can see more of here. This year’s collection of trees can also be seen on The Glue String. 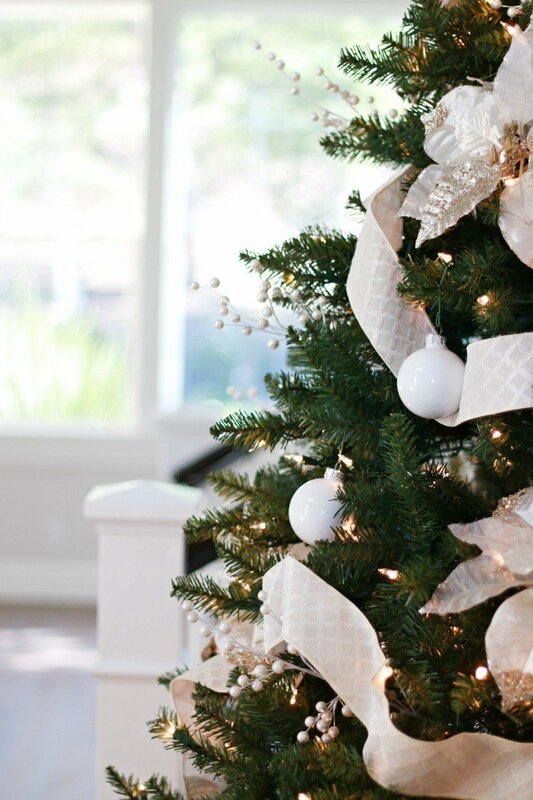 If you’re just getting started on your holiday decor, you can also check out some of the ornament projects and tutorials available on Michaels.com. 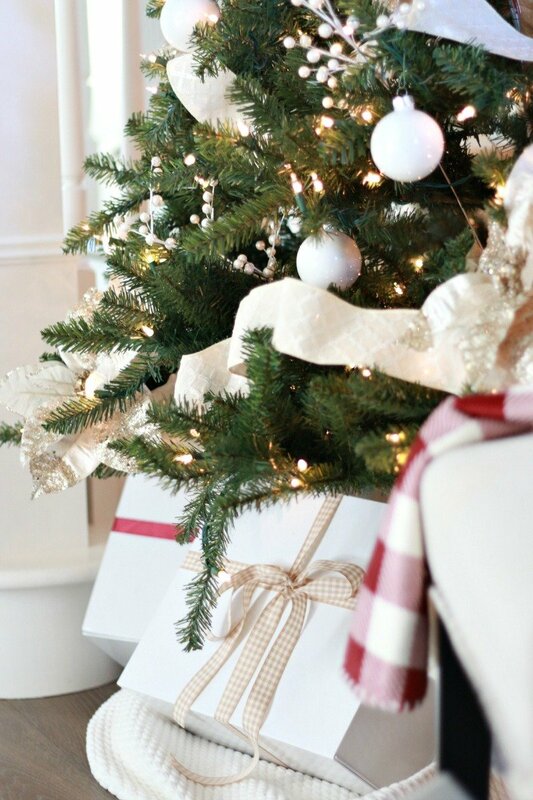 And from now until November 14, you can get FREE shipping on all Christmas trees that are 6ft or taller on Michaels.com! Now you are in for a real treat because the other Michaels Makers created the most imaginative and gorgeous trees. I am so honored to be a part of this creative and inspiring group. Grab a hot tea or coffee and take a look around below. I promise it’s worth it. Thanks so much for stopping and kicking off the next couple of months with me. Cheers. 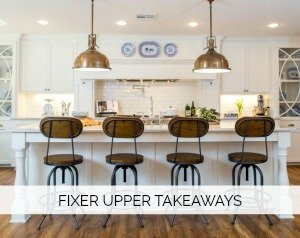 *paint color in my sister’s home is Pale Oak by Benjamin Moore. Affiliate links used. Proud to partner with Michaels on this post. I LOVE this simple tree. Dave would be all about having multiple trees in the house. He LOVES Christmas and I am sure that he would be beside himself if I let him put up trees already. And that Salted Carmel drink – Yes Please!!!! Love it Courtney! Looks great and that cocktail looks delic! Thank you, Rebekah. So sweet. Thanks for popping in! I absolutely adore your tree Courtney! 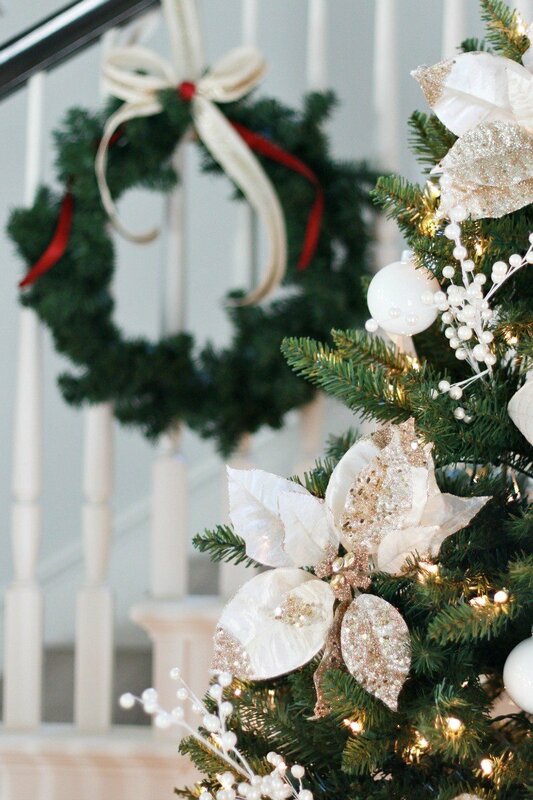 You always have the most amazing theme that just screams Christmas. And that cocktail sounds delish! Tiffany! Sweetest compliment. Thank you so much. I hope it puts everyone in the holiday spirit. Between Thanksgiving and Christmas there is so much to celebrate over the next 8 weeks. I love the simple color scheme – so clean and crisp. Would also love to see a house tour of your sister’s home. It looks beautiful! Thanks, Kimberly! Yes. I will for sure share more once she is all moved back in. They did some work on it and are just settling back into it. Courtney, this is no less than I expected of your impeccable taste. Can you give a girl a clue on the numbers of flowers, stems, ribbons, etc? Or maybe a way to estimate. For the first time I want to be on this and have a decorated, not hodgepodge of what’s leftover at the stores, tree. Thanks gorgeous! Ah. You’re so sweet. Yes! Absolutely. I should add that to the post. Great idea. First and foremost I don’t necessarily decorate the back if it will not show. So this tree was set up that way. I used ten large flowers and ten stems of the pearls. I used three rolls of ribbon but would have liked to have used 4-5. They were sold out at the time I bought the ribbon. I hope that helps. Have so much fun decorating and then enjoying it all season! Hi Karin. Thank you! Yes, it’s from HomeGoods. And it’s new so they should have some floating around. Thanks for the sweet comment. Gorgeous!! 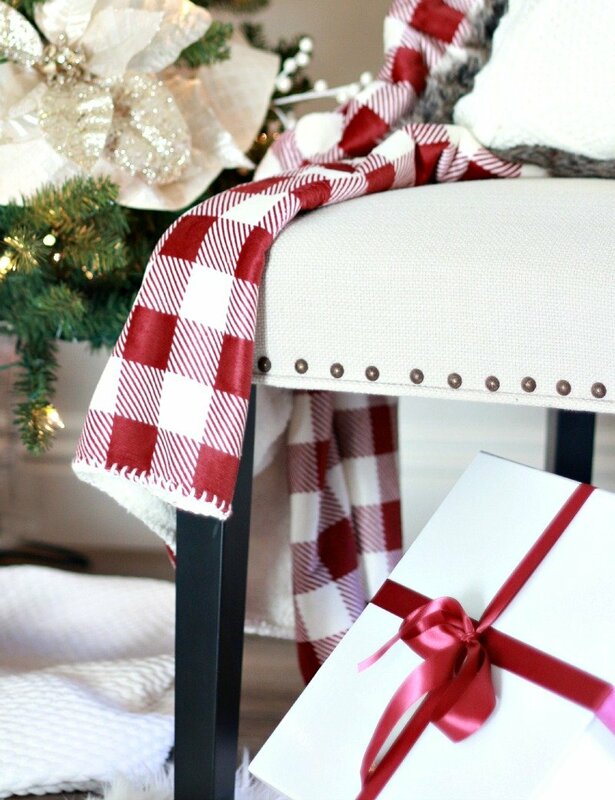 I love the tree skirt! What is it?? Would look lovely under my 2 winter wonderland trees! Yes. That would look great. It’s just a blanket. I always use a blanket if I don’t have a skirt. Hope that helps. So many great choices in stores. . . and you can use it year round. Even better. Courtney, it is just beautiful. 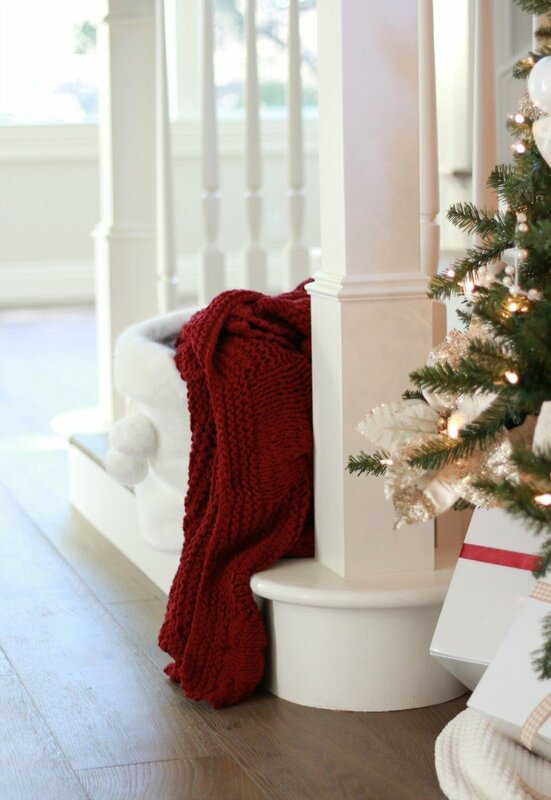 Very elegant, classic and festive. I love the whites and creams with the pop of cranberry. Your sister’s home look gorgeous and I am drooling over her staircase. Love the black bannister! 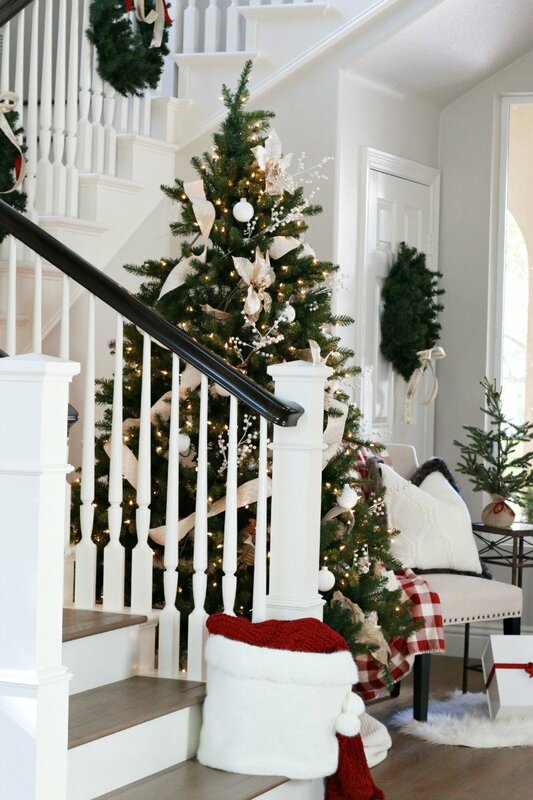 Her foyer is the perfect spot for a tree. I’m with you and agree that family is everything and how wonderful your sister is back and you’ll all be together this year. Thank you so much, Allison. Her home is really so beautiful. I think I should move right in, don’t you. So fun having her back and shooting these pictures with her for the blog was so fun. Excited to start celebrating my favorite season of the year. I love the theme trees. Love them. They looks so much cleaner than the hodge podge trees most people put up. But how to reconcile a themed tree with the bazillion other ornaments that you have? More than one tree? 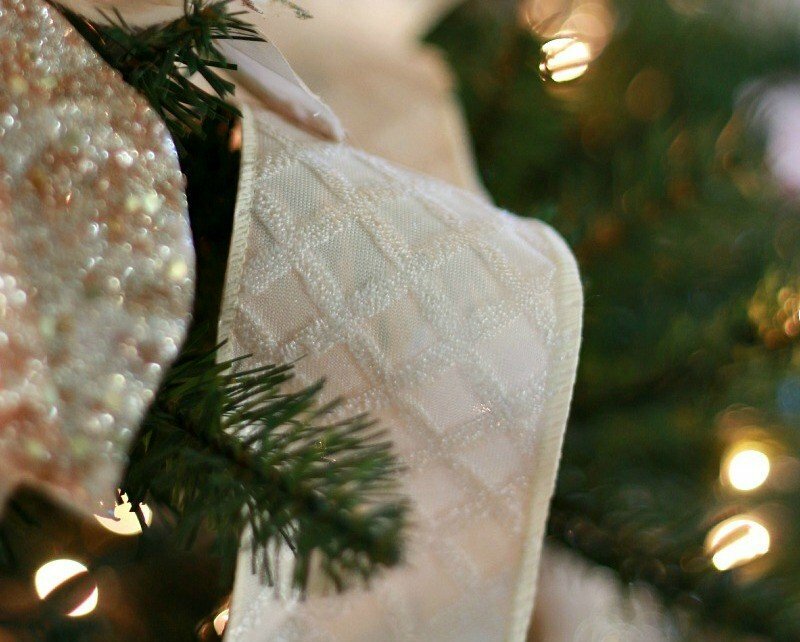 Don’t use the sentimental ornaments that the kids make? I’m just curious what other people do with ornaments that don’t fit the theme. I LOVE this tree! So beautiful. Did you get everything for it at Michaels or just the ribbon?